Finally, doing solar electricity the right way. It’s called “distributed power generation” as opposed to centralized generation. The solar cells will go on the vast rooftops of malls, and office complexes (or adjacent to them) in California. After spending over 20 days exploring the California and Nevada deserts I am more opposed than ever to the use of lands that are remote from the load for solar electricity. California utility plows ahead with midsize solar. By Martin LaMonica. Green Tech in CNet News. Finally some good news about alternative energy! I must say that the current horrific oil leak in the Gulf of Mexico is rather well-timed with respect to Obama’s new offshore oil-drilling plans too. It’s odd about oil drilling plans, but the first time the politics were in place to open up the Arctic National Wildlife Refuge for oil drilling (1989), the Captain of the Exxon Valdez got drunk and let his tanker run into Bligh Reef, spilling 11 million gallons of crude into Prince William Sound, Alaska. The subsequent political backlash took drilling the Refuge off the table until George W.
I wonder if the Gulf of Mexico disaster could do the same? and for fish of all kinds. The fishing industry is not going to be pleased, and hopefully after reading about the safety issues the American public will get the picture that Big Oil is not some benevolent entity. Some may wake up anyway. I’m sure it’s still “drill baby drill” to the Sarah Palin types. Really sad about the people killed in this and the mining tragedy, and probably avoidable. I would like to see some action on enforcing environmental and safety standards. Not likely, huh? I speak from experience when I tell you that oil companies do not police themselves and will not put safety measures in effect unless they are forced to do so by the government. It is no surprise that BP and all of the other majors spend much of their time lobbying to get around environmental rules. There is much cheating going on and it will continue until they get caught! Of course, everyone takes photos of the Sierras there. Mt. Whitney is just left of center. They ignore the Inyo Mountains on the valley’s other side. 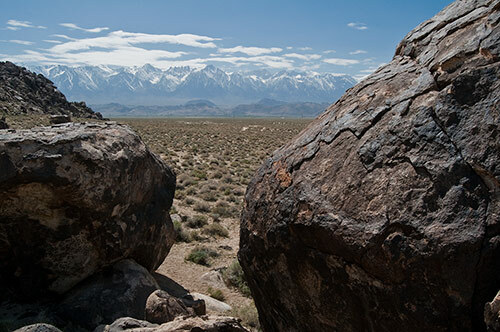 Therefore, I found my way over to to the big boulders at the base of the Inyos (a surprisingly rough range when you are close up) and shot the photo. There was talk about covering some parts of Owens lake (now dry) with solar panels. I think the local community was fighting the proposal. But we have plenty of room on both sides of the Owens river to install panels without harming nature too much. the valley folks have a very deep distrust of DWP and with good reason. Cattle would be bothered some, but I could not care less about them. Next time you make it to Lone Pine, try taking the road to Horseshoe Meadows (email me for directions if you want them). At the top of the road right before you go into the National Forest there is a Look out point that is amazing. You can see most of the Owen Valley surrounding the dry lake. a small concentration of solar panels would not be as visible from up there as the large project that was being planned for the lake. That would have killed the viewing from Horseshoe meadows road. Thanks. I hope to go back. I love to see new country! They have completed rewatering Owens Lake project, according to a local RV Park owner. Of course, this is just putting a foot of water on part of the dry lake bed, but it will reduce the dust storms and I could see quite a bit of waterfowl on the Owens River which was running pretty full at the secondary road crossing just east of Lone Pine. The RV Park owner told us that LA was trying to make up for the “lost” water used to rewater the lake by draining the deep aquifer that supports Crystal Geyser (or was is Springs?) water. She wasn’t happy. I need to check on the aquifer thing. On the solar panel thing, I understand there are two proposals. Here is a link from an unfriendly web site.